Vigee-LeBrun was Marie-Antoinette's favorite portraitist and such a close confidant that the queen aided her entrance to the Academie by having her husband Louis XVI interfere on her behalf . This event caused whispers that she was intimately involved with the sovereign and in contemporary terms that she basically slept her way to the top. Looking at this portrait of the queen that pronouncement is a little difficult to acknowledge as truth. Vigee-LeBrun was a true royalist and had to flee France the night of the Revolution are true however. 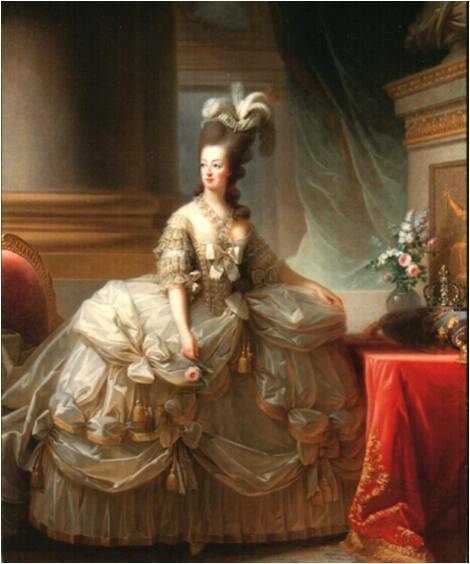 In this rococo painting of the notorious queen who was blamed to almost single-handedly, bring down the ancien regime Vigee-LeBrun depicts Marie-Antoinette in all her royal glory. The queen is shown standing in a very elaborate dress of satin and lace with huge paniers holding out the skirts attesting to her noble status. The red velvet covered table that holds the crown and the bust of her husband Louis XVI seen on top of the column to her right are also some of the elements befitting a queen that are incorporated into the painting. 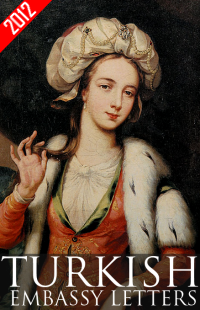 This is the first portrait Vigee-LeBrun painted of the queen from real life. Similar to a history painting, it is a huge work involving many components and would have taken several sittings. 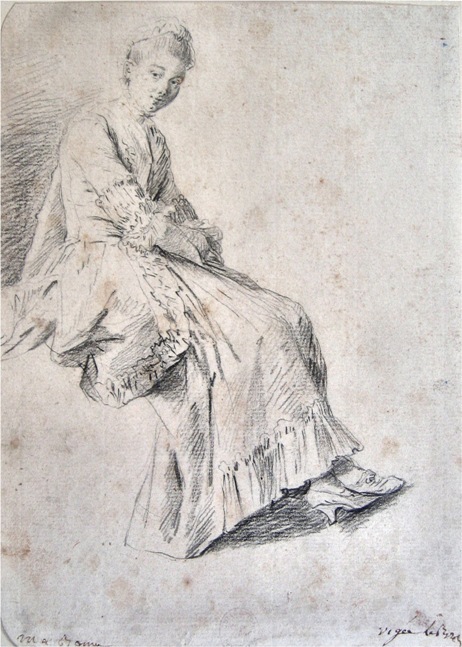 Vigee-LeBrun wrote her memoirs explaining how she proceeded with making portraits of royalty, starting with trying to make the sitter very comfortable. In order to avoid the sitter appearing too tall, she made sure that the head was not placed too high on the canvas. Another important factor to take into consideration was for the model to be presented in a space where she did not overtake it. Although this is a painting in the rococo style, with an abundance of drapery and flowers and soft brush strokes, critics still identified the brush strokes as a sign of Vigee-LeBrun's identity as a female. 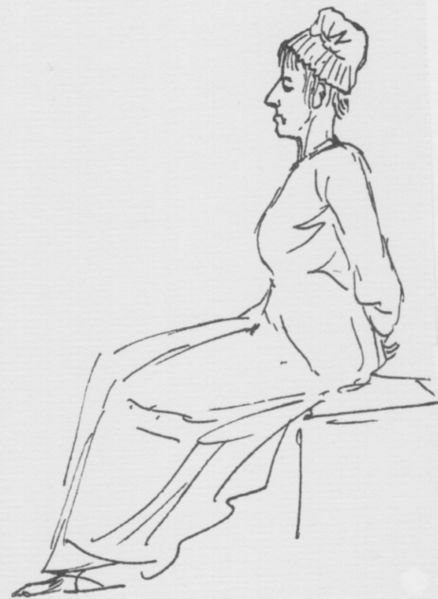 The cross-hatching technique that was taught at the academy was also considered feminine as opposed to Jacques Louis David's strong contours. Maybe identifying all that was of the ancien regime and corrupt as a feminine style and adapting a more stern style in art and calling it more masculine was more consoling to their sensibilities. It is also interesting to compare Vigee-LeBrun's painting of Marie-Antoinette in 1778 to the drawing of David in 1793. It may even be recognized as a lesson in humility.